This article is about the recurring winged Goomba. For the winged Galoomba from Super Mario World, see Flying Goomba (Super Mario World). For the identically-named Galoomba from Super Mario World, see Para-Goomba (Super Mario World). For the winged and spiked Galoomba from Mario Clash, see Para-Goomba (Mario Clash). Paragoombas (originally formatted as Para-Goombas and also known as Winged Goombas) are Goombas that have small wings protruding from either their head or torso. Just like Koopa Paratroopas, they jump up and down and shed their wings and change into their regular form upon being stomped on the head. Para-Goombas made their debut in Super Mario Bros. 3, in which they appear as somewhat common enemies. Red Para-Goombas attack by hopping low along the ground, with a larger jump every third hop, while brown ones attack by flying in the sky and dropping Micro-Goombas. Ordinary Goombas do not appear in Super Mario World; however, the localization team at the time gave the name to a similar but different species (Kuribon, later called Galoomba). As such, there are two equivalents of Para-Goombas in name and function: Para-Goombas (Para Kuri in Japan) utilize parachutes, and Flying Goombas (Pata Kuri in Japan) have wings. Para-Goombas appear in Super Mario Land 2: 6 Golden Coins, acting like the red ones in Super Mario Bros. 3. However, their artwork depicts them as being brown. Paragoombas appear very rarely in New Super Mario Bros. They are only found in a single level, World 2-4, where only two of them appear. They act mostly like the red ones in Super Mario Bros. 3, despite being brown. One stomp turns them into regular Goombas, two stomps defeat them, and a Ground Pound takes them out instantly. When Mario jumps over them, they turn behind and follow him, until they turn into a regular Goomba. Paragoombas appear in New Super Mario Bros. Wii. They act just like they do in its predecessor, but they are more common. They only appear in World 7-5 and World 8-2. Like other enemies, Paragoombas can now be defeated with a Spin Jump, which does the same effect as a ground pound; it takes out a Paragoomba instantly. Paragoombas on a Bonus Planet in Super Mario Galaxy 2. In Super Mario Galaxy 2, Paragoombas appear as an enemy once again. However, instead of hopping on the ground, they can actually fly up and down or side to side. This is the first time that Paragoombas appear in a 3D Super Mario platformer game. There is also a giant form of Paragoombas in Supermassive Galaxy. If Mario jumps on them, they get flattened and disappear, instead of becoming a regular Goomba; the latter only happens if they are licked by Yoshi. They are one of the few enemies that did not appear previously in the predecessor. Paragoombas reappear in Super Mario 3D Land where they have the same behavior as in Super Mario Galaxy 2, and, as such, can be defeated with a single stomp. Paragoombas make an appearance once again in New Super Mario Bros. 2. They maintain their behavior from New Super Mario Bros. Wii. When Mario touches a golden ring, the Paragoombas turn gold and can produce coins when hit. Paragoombas appear only in Seesaw Shrooms in New Super Mario Bros. U, where they act in the same manner as in the predecessors. Paragoombas make a reappearance in Super Mario Maker and Super Mario Maker for Nintendo 3DS. 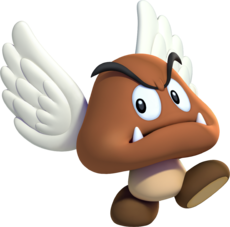 After a player puts wings on an ordinary Goomba, the respective foe becomes a Paragoomba. In this form, it behaves like the red Paragoombas from Super Mario Bros. 3, as it follows Mario in an attempt to hurt him. Here, Paragoombas hop in the same cadence as in past 2D Mario titles. Especially in this game, the player can stack enemies on top of each other so they become enemy towers; when a Paragoomba is at the base of such living tower, it is able to lift the creatures above him while hopping, no matter how tall the tower is. Another aspect of this game is that one can place Super Mushrooms on enemies so they become giant, so to speak, or at least bigger variants of themselves. Likewise, a Paragoomba becomes a Big Paragoomba under the effect of a Super Mushroom. Paragoombas appear in Super Mario Odyssey. They are found in the Cap Kingdom and a secret area in the Wooded Kingdom, and can be captured by Mario with Cappy. Once captured, Mario can fly by pressing the button, and shaking the Joy-Con allows him to fly faster. Vertically, he can only fly up to a short specific height; however, this maximum height increases if Mario lands on ground higher than he previously was on. Horizontally, he can fly all the way to the level boundaries. 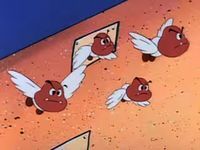 Four Para-Goombas from the The Adventures of Super Mario Bros. 3 episode "Mind Your Mummy Mommy, Mario". Para-Goombas appear in many episodes of The Adventures of Super Mario Bros. 3, such as "True Colors" and "Super Koopa", which feature them as underlings of King Bowser Koopa, as well as the Koopalings. As Mario explores the Mushroom Kingdom in Double Trouble, he can encounter a swarm of Para-Goombas, which begin dropping Micro-Goombas on him. If Mario decides to try and pick the Micro-Goombas off instead of immediately running for cover, he is overwhelmed, but ultimately left alone when the Para-Goombas find him unappetizing. If Mario runs for cover in some pipes, he picks the Micro-Goombas off, and waits until the Para-Goombas get bored waiting for him to come out and leave. In Yoshi's Safari, Para-Goombas are known as Flying Goombas and appear quite frequently as enemies. They attack Mario and Yoshi by charging into them, inflicting a minimal amount of damage. A Flying Goomba in Yoshi's Safari can be defeated by shooting it with Mario's Super Scope once. In Hotel Mario, Para-Goombas are known as Flying Goombas. They aimlessly attempt to fly on the floors of Lemmy's High-ate Regency Hotel. However, some Flying Goombas have Banzai Bill avengers that come at Mario if he stomps the Goomba. They have a tougher variation called the Rhinestone Goomba. Though absent from games for some time, Paragoombas make a reappearance in Paper Mario. They are enemies encountered early in the game, on Goomba Road. In Paper Mario, Paragoombas attack by swooping downward. They can only be damaged by being jumped on or by having an item used against them. When Mario jumps on them, they lose their wings and become regular Goombas. In all, they are almost exactly the same as normal Goombas. Two new versions of the Paragoomba are introduced: a gloomy blue one called Paragloomba, and a hyperactive green one called Hyper Paragoomba. In Paper Mario: The Thousand-Year Door, Paragoombas appear as enemies in several locations, such as Rogueport Sewers, Petal Meadows and Hooktail Castle. Just as in Paper Mario, the Paragoombas of Paper Mario: The Thousand-Year Door are immune to attacks involving the use of a hammer, capable of only being harmed by a jump attack, item, or Crystal Star attack. One Paragoomba (who is named Paragoomba) plays a somewhat large role in Paper Mario: The Thousand-Year Door's plot as the one minion who informs Bowser that Mario has collected the last Crystal Star during the Koopa King's escapade in Poshley Heights. In Super Paper Mario, Paragoombas appear as basic enemies in Lineland, Gloam Valley, and The Bitlands. They can be defeated by such attacks as being jumped on, or by being attacked by a Pixl. Jumping on a Paragoomba causes it to automatically lose its wings. They appear in the Flipside Pit of 100 Trials in rooms 12 and 26. Paragoombas reappear in the Nintendo 3DS game Paper Mario: Sticker Star, with a slightly different design more closely resembling that of the Paragoombas in New Super Mario Bros. Wii. They appear in World 1's last level Goomba Fortress, and appear commonly in World 2. They have more HP and attack than their previous iterations. They still are not very powerful, but they can come in groups of two or three and aid Spinies, Paratroopas, Spikes, Pokeys and Swoops for extra help. Two new sub-species, the 5-Fold Paragoomba and Shiny Paragoomba, were also introduced. Their only method of attack is jumping on Mario and Paragoombas try to trick the player because if the player uses a hammer type sticker except the Hurlhammer sticker, Paragoombas jump up in air meaning Mario's attack have been dodged. Paragoombas can be beaten in the first strike without engaging in combat with them once the player has two Royal Stickers. Shiny Paragoombas, Ninjis and the Wiggler Segments are the other enemies that can dodge Mario's attacks. A Paragoomba from Paper Mario: Color Splash. Paragoombas reappear in Paper Mario: Color Splash. They have the same appearance and behavior as they do in Paper Mario: Sticker Star. They can appear in battle after being called in by a Whistle Snifit. A Paragoomba Card also appears in the Sacred Forest. While Paragoombas do not appear in Mario & Luigi: Superstar Saga, unused data and an unused sprite for Paragoombas exist in the game's files. They do appear in the remake, where they are enemies and allies in Minion Quest: The Search for Bowser. They first appear in the level "Winged Traitors". They are Flying troopers, and attack by swooping into enemies. Their special attack, Cranium Crush, involves them flying above an enemy and slamming down on them. In Mario & Luigi: Paper Jam, after the Mario brothers defeat Wiggler, it faints and four Paragoombas carry it up to the sky before it transforms into a Flutter. Later in the game, their paper versions appear as enemies. Paragoombas appear in Mario & Luigi: Bowser's Inside Story + Bowser Jr.'s Journey as enemies and recruitable allies in the Bowser Jr.'s Journey mode. Like other Goomba variants, Paragoombas are weak against yellow Shy Guy. Paragoombas also appear as enemies in Super Princess Peach. They again drop Micro Goombas, but this time, they completely weigh Princess Peach down. This game also introduces Paragoombas that have been altered by the Vibe Scepter, Sad Paragoombas. Red Paragoombas return, and they have their same traits as in Super Mario Bros. 3, only being able to hop. However, they can jump low and high. There is also a variety of vibe-induced Red Paragoombas – Mad Red Paragoombas. Both respond the same to attacks as Paragoombas in other 2D titles, in that one stomp takes away their wings. Paragoomba became playable for the first time in the game Mario Superstar Baseball, which features Goomba and Paragoomba as a member of Donkey Kong's team. Paragoomba is a Speed-type character, with a good speed stat, but it is a poor batter and his pitching is the worst in the game, while its fielding is average. Its ability is Super Jump, which allows it to make large leaps into the air in order to catch the ball. Paragoomba shares good chemistry with Goomba, Koopa Paratroopa and Monty Mole. Paragoombas in the audience, in the Mario Super Sluggers opening. Paragoomba reappears as a playable character in Mario Super Sluggers. Its batting stat is the same as in the predecessor and it is slower than it was before, but its fielding was improved and its pitching was greatly improved, with both stats being above average. Paragoomba has good chemistry with Goomba, Monty Mole, and the two Koopa Paratroopas. Paragoomba has bad chemistry with Toad, Toadsworth and Toadette. Paragoomba is no longer on Donkey Kong's team, now being on Wario's team instead. In addition, Paragoombas are seen as spectators in the stands. Paragoombas appear in Mario Party 8. In the title screen, two are seen flying by while holding a Star Carnival banner in their mouths. Paragoombas are also seen in Test for the Best. A Paragoomba can be seen in Mario Party: Island Tour on the Star-Crossed Skyway board alongside Flutter and a Paratroopa on the first, second, and fourth Star Stages. It gives out five Mini Stars. They also appear in the minigame Sky'd and Seek. In Mario Golf: World Tour, Paragoomba is one of the names that can appear on the tournament scoreboard. Tattle This is a Paragoomba. Obviously, Paragoombas are Goombas with wings. Max Hp: 2, Attack Power: 1, Defense Power: 0 You can't hit 'em with the Hammer while they're airborne. If you damage 'em, they'll fall to the ground and become ordinary Goombas. Card Description A Goomba that has been through airborne training. One stomp, and it's like it never went to flight school. Quotes Usual: "I'll swoop ya!" ~ "I can fly! Whee!" ~ "Behold—the power of Paragoomba!" ~ "Wish I could fly higher..."
Grounded: "I've been grounded. *sob*" ~ "My wings! NOOOOO!" "A Goomba with wings. Just like Koopa Paratroopa, Paragoombas lose their wings and turn into Goombas if they get stepped on. The Goomba family is made up of expert bunters, although no one really makes a big deal out of it, bunting, after all, isn't all that glamorous." Paragoomba A defensive specialist with great hops! In Super Mario Bros, the first enemy Mario encounters is a Goomba. I lost a life to it just seconds after starting! If you add some easily removable wings to that creature, you've got yourself a Paragoomba. Flying mushrooms—that really does just sounds nuts. The first enemy to appear in the original Super Mario Bros. is a Goomba. A lot of people have fond memories of carelessly walking into it and losing a life in two seconds flat. A Paragoomba is a Goomba with wings. Nuts, right? Wrong. Goombas aren't nuts—they're mushrooms, silly! Goombas who soar the sky with grace. With a spin they can do a Cranium Crush. For this subject's image gallery, see Gallery:Paragoomba. Patakuribō Pata is an onomatopoeia for a flapping sound and kuribō is Goomba's name in Japanese. German Para-Gumba The English name adapted to German spelling. Romanian Paragumba (The Adventures of Super Mario Bros. 3) Transliteration of "Paragoomba"
↑ Super Mario Bros. 3 English instruction booklet, page 35. ↑ Super Mario Advance 4: Super Mario Bros. 3 Nintendo Power Player's Guide, page 13. ↑ Nintendo Power Volume 10, page 21. This page was last edited on April 14, 2019, at 08:13.